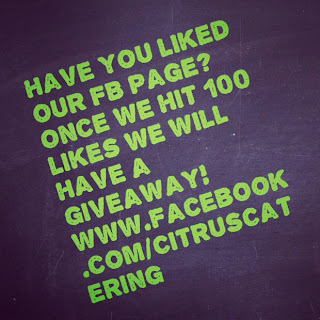 Citrus Catering & Events: The Foodie Blog: 100 likes Giveaway! Those that follow me on Facebook already know that we are quickly approaching our very first GIVEAWAY!! Once we reach 100 likes on our facebook page, I will post the rules for entering the giveaway. So the next question, what will I be giving away??? Stay tuned, more on that soon! In the meantime, send your friends over to our Facebook page to 'like' us!